That’s the call once made by the Hall of Fame umpire Bill Klem. It’s not a reviewable decision! But now the Church offers its own argument. In its first-ever document on sport, the Holy See provides a Christian perspective not just on baseball but on all sports as they relate to the development of the human person. Published on June 1 by the Dicastery for Laity, Family, and Life, “Giving the best of yourself” draws on a repeated exhortation of Pope Francis to link the search for victory and the quest for sanctity. The five-part text first explains the Church’s motive for stepping onto this field, offers a genesis of the sporting phenomenon, highlights multiple areas of significance, identifies a few ethical challenges, and sets the lineup for a pastoral ministry in this arena. It’s an ambitious undertaking. Sports, after all, are played across the globe, on fields of varying size and shape, with players of all ages and abilities and aspirations, and scores of others connected in technical, financial, or supportive roles. The very notion of sport encompasses a wide range of recreational activities, competitive contests, and professional matches, the full scope of which cannot be examined in a single document. Scholars have long explored the civic, folkloristic, mythopoetic, and even architectural connections between sport and religion. Sports reveal ideological dimensions in their myths, values, and beliefs. Sports observe cultic practices in their rituals and observances. Sports celebrate their “saints” (heroes) and revere their sacred traditions (records). Some sports, like baseball, have a distinctively religious power, as the legendary umpire stated and this author also proposed. Sports involve people, unified in body, soul, and spirit and active individually and/or on teams. Sports develop virtue in the display of creative abilities and in the exercise of fair play. Sports exhibit an intrinsically playful (“ludic”) purpose, even at a professional level. When all have the chance to play, sports reflect solidarity and engender respect. Owing to their competitive character, sports require courage and demand sacrifice, both of which, when embraced, can lead to joy and harmony no matter what the score is. That mutual vision, introduced by a letter from Pope Francis and enhanced by many references from his predecessors, governs the ongoing work of the dicastery’s section (office) on Church and Sport. It may not resonate with barstool analysts at the local sports pub. And it likely won’t get any airtime on sports talk radio. But it does speak to those who see sports in a higher light, particularly those who play a part in athletic ministries. At the local level, Catholic Youth Organizations serve parishes and dioceses in their quest to guide youth to connect athletics and spirituality. In higher education, administrators are studying how to integrate joy, compassion, respect, enlightenment, love and balance into collegiate sports as a result of a conference on “Sport at the Service of Humanity.” And even on the professional level, groups such as Catholic Athletes for Christ serve to link faith and sport with athletes, coaches, staff and employees at ballparks and stadiums around the country. On this, the ump and the pope agree – sports really are more than just games. 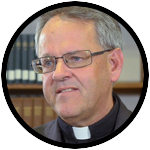 Father Dailey is the John Cardinal Foley Chair of Homiletics and Social Communications at St. Charles Borromeo Seminary, Wynnewood, and a research fellow for the Catholic Leadership Institute in Wayne. Sports are not a substitute for a direct encounter of unconditional trust in Christ. Everything else is secondary. This is just another distraction when it is not put in proper perspective.